It was the sunniest of pools, it was the foggiest of pools, but the architectural approach is similar: there is nothing unnecessary. Swimming pools remain a favorite community recreation all across the country. Two recently completed pool facilities in California, one in San Francisco and the other in Calistoga, have a lot in common. Both are community pools set in public parks in Northern California. Yet they take on very different forms in response to different user groups, sites, and microclimates. Paulett Taggart, FAIA, principal of Paulett Taggart Architects in San Francisco, designed the Calistoga Community Pool in Napa Valley and, in a joint venture with Mark Cavagnero Associates Architects, Sava Pool in San Francisco. We spoke with her about the factors that shaped the design of each facility. Q: Let’s start with Sava Pool in San Francisco. In this case, you were replacing an existing pool facility that had been built in the 1950s. Why did it need replacing? Paulett Taggart: Sava Pool is only a couple of miles from the Pacific Ocean. The original facility was built of wood and steel, which deteriorated over time inside and out because of exposure to salt-laden fog and chlorine. So in replacing it, we considered various materials. 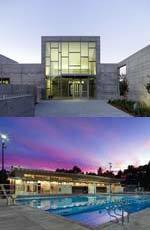 The most durable solution was exposed cast-in-place concrete with an aluminum curtain wall system. Q: Was there any resistance to going with concrete? Taggart: There was some, but durability won out. This was in 2007, and steel costs were escalating at a fast rate. And there wasn’t really a better choice for that site than concrete. In addition, the concrete is paired with a local handmade tile on the framed walls on the exterior and Alaskan white cedar in the natatorium. Q: Who uses the pool? Taggart: There are some families and children, but the predominant group was the lap swimmers, including three high school swim teams. So the facility is built around the lap pool. Q: In addition to the climate, how did the site itself shape the design? Taggart: It’s a uniquely challenging site. It’s at one end of a two-block public park, across the street from Stern Grove, another larger recreational park to the south. But it’s flanked by 19th Avenue, a heavily trafficked eight-lane road, to the east, and a residential neighborhood to the west. To minimize the impact on the park, we largely followed the same footprint as the old building. However, we moved the main entrance, so instead of facing 19th Avenue, as in the old facility, it now faces south toward Stern Grove. We took advantage of the south-facing entry to create a courtyard to capture the sun and provide protection from the prevailing winds. The courtyard is both a welcoming entry and a useable outdoor space adjacent to the community room and the natatorium. Q: With the Calistoga Community Pool, I understand community input changed the design. Taggart: Yes, originally we went with the most obvious strategy, which was to keep the parking at the front of the site and place the pool adjacent to the Napa River. But neighbors on the quieter, southern side of the river expressed concern about noise from children playing in the pools, so we redesigned the facility to put the pools between the park’s new bathhouse to the south and a row of mature oak trees to the north. This allowed the bathhouse to serve as an acoustical barrier between the pools and the neighbors across the river. The location had another advantage – the large trees to the north help give it a real sense of place. Q: What else shaped the design? Taggart: The budget was extremely tight. We worked with different user groups to identify what the community wanted, and then pared it down to the elements that were the most essential. Additional needs could be met in the second phase. The main goal was to create a place where the children in the community could learn to swim and exercise, so the first phase includes a lap pool, a recreation pool, the bathhouse, parking, and the landscaping necessary to support these areas. As the community raises more money, they will add a slide pool and a community center. Even after dividing the work into two phases, the tight budget drove us to create extremely sustainable solutions. We looked at other buildings and pools in Calistoga, and many were small, simple structures that took advantage of the warm climate. So we created an open structure with a butterfly-roof form that encourages natural breezes – in essence, it’s an indoor/outdoor building that ventilates itself. That allowed us to eliminate windows and mechanical conditioning systems for most of the building (except for one small office). The butterfly roof became the architecture of the building. That saved on construction costs/materials and energy consumption over time. I am often asked how much more it costs to make a building sustainable – in this case, it cost less. Q: Tell us more about the sustainable strategies at Calistoga. Taggart: Over time, the largest cost of running recreational pools is heating the water. We studied different green strategies, and the best approach was a combination of solar-thermal and geothermal heating. There is a capital campaign under way to raise money for completing these systems. In the interim, we put in high-efficiency units to heat each pool. The key to this was working with a mechanical engineer who was familiar with the design of geothermal systems. It is expected that within the year, solar thermal can be installed on the bathhouse roof, and that will provide about 80% of the energy required to heat the smaller pool. Down the road, they can install a geothermal system, and that will provide enough energy to heat the lap pool. We advocated for this instead of a more elaborate bathhouse structure. As with many projects, the final result comes from paying attention both to the big picture and to every small detail. Q: How are Sava Pool and Calistoga Community Pool different? Taggart: They’re very different in the way they respond to the sun. In Calistoga, there’s a lot of sunlight and a hot summer, so we needed to carefully consider how to provide enough shade. Trees were added to the east and west, umbrellas fit into slots in the concrete benches around the pools, and shade structures are part of the acoustical wall structure at the south and west edge as it extends beyond the building. The butterfly roof encourages breezes to naturally cool the building, so we didn’t have to air-condition it. Sava Pool is the opposite – it’s foggy on the San Francisco coast, so we wanted to maximize the amount of sunlight while making sure the light is balanced. 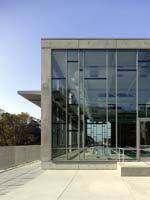 The natatorium has windows on all four sides. The south wall, which faces Stern Grove, is all glass. It’s a great vista – when you swim, the water line is at the floor line, so you look out directly to the grove of trees. Large windows and roof monitors bring in lots of natural light, while brises soleils protect the windows from the glare. This isn’t the warmest part of San Francisco, but when the temperature is mild, there are operable windows that circulate fresh air through the natatorium. Q: How are they similar? Taggart: The architectural approach is similar in that there is nothing unnecessary. The practical needs of the building inform the concept and become the architecture. For Calistoga, it is the butterfly roof. For Sava, it is the overlay of simple forms. Both facilities can disappear into the landscape, depending on where you view them from. Both buildings feel like they were meant to be there. Most of the users come regularly to exercise, so it’s about serving their needs – these facilities aren’t like museums or theaters, which want to stand out. 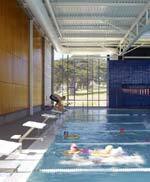 You want pool facilities to be part of the places they’re in. And to be open and welcoming. Paulett Taggart Architects is committed to producing modern, site-specific architecture that makes significant contributions to society. Specializing in civic buildings and affordable housing, the firm pursues an interactive design process that engages daylight, regional materials, and structure to create spaces that are both rational and enduring. The firm’s work has been recognized by numerous local, national, and international awards. Project/Construction Manager: SF Rec and Park Dept. Acoustics: Illingworth & Rodkin, Inc.
Top: Sava Pool, San Francisco, by Paulett Taggart Architects in a joint venture with Mark Cavagnero Associates. 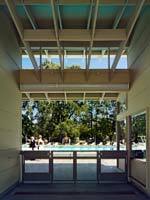 Bottom: Calistoga Community Pool, Napa Valley, by Paulett Taggart Architects.